Tourette syndrome (TS) is an inherited, neurological disorder characterized by multiple involuntary movements and uncontrollable vocalizations called tics that come and go over years. In a few cases, such tics can include inappropriate words and phrases. Signs and symptoms of Tourette syndrome typically show up between ages 2 and 12, with the average being around 7 years of age. Males are about three to four times more likely than females to develop Tourette syndrome. Tourette Syndrome can affect people of all ethnic groups; males are affected 3 to 4 times more often than females. It is estimated that 100,000 Americans have full-blown Tourette Syndrome, and that perhaps as many as 1 in 200 show a partial expression of the disorder, such as chronic multiple tics or transient childhood tics. Although there's no cure, you can live a normal life span with Tourette syndrome, and many people with Tourette syndrome don't need treatment when symptoms aren't troublesome. Symptoms of Tourette syndrome often lessen or become quiet and controlled after the teen years. The natural course of Tourette Syndrome varies from patient to patient. Although symptoms range from very mild to quite severe, the majority of cases fall in the mild category. It is generally believed that abnormalities in genes are responsible for most cases of Tourette Syndrome. Genes are passed on to a child from each parent and determine what we look like, how our body functions and even what diseases we may get. A child is more likely to develop Tourette Syndrome if they have a father, mother, brother or sister with it also. Some studies have shown that there are some minor defects in the structure and working of the brain in children with Tourette Syndrome. Studies also suggest that there may be a problem with one of the brain's chemicals called dopamine. There is not a lot of information available about the detail or significance of these changes. Although it has not been proven, there is some evidence that problems during pregnancy or childbirth may increase the risk of a child developing Tourette Syndrome. This may include problems such as prolonged labour, high levels of maternal stress in pregnancy, or babies with very low birthweight. There is also possibly a connection with a particular infection with the streptococcal germ in some children with Tourette Syndrome. This is a fairly recent discovery and not very much is known about the link. The first symptoms of are usually facial tics--commonly eye blinking. However, facial tics can also include nose twitching or grimaces. With time, other motor tics may appear such as head jerking, neck stretching, foot stamping, or body twisting and bending. Tourette Syndrome patients may utter strange and unacceptable sounds, words, or phrases. It is not uncommon for a person with Tourette Syndrome to continuously clear his or her throat, cough, sniff, grunt, yelp, bark, or shout. People with Tourette Syndrome may involuntarily shout obscenities (coprolalia) or constantly repeat the words of other people (echolalia). They may touch other people excessively or repeat actions obsessively and unnecessarily. A few patients with severe Tourette Syndrome demonstrate self-harming behaviors such as lip and cheek biting and head banging against hard objects. However, these behaviors are extremely rare. Many children develop tics lasting a few weeks or months that go away on their own. But whenever a child shows unusual behavior, it's important to have a medical evaluation to identify the cause and rule out serious health problems. 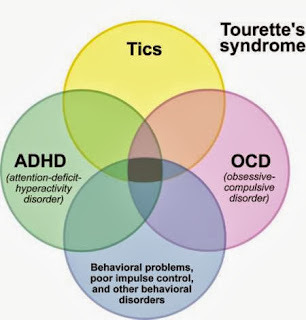 What disorders are associated with Tourette Syndrome ? Not all people with Tourette Syndrome have disorders other than tics. However, many people experience additional problems such as obsessive compulsive behavior, characterized by an intense need to act repeatedly, such as hand washing or checking that a door is locked; attention deficit-hyperactivity disorder, characterized by difficulty concentrating and staying on task; learning disabilities, which include reading, writing, and arithmetic difficulties; or sleep disorders, which include frequent awakenings or talking in one's sleep. If a child has Tourette's syndrome they are also likely to have one or more related conditions. It is not clear why these other conditions occur at the same time. Only about 1 child in 10 with Tourette Syndrome has no other associated problem. The most common conditions seen with Tourette's syndrome are listed below with how often they occur in children with Tourette Syndrome. Obsessive-compulsive disorder (OCD), or obsessive-compulsive behaviour (OCB). This occurs in about 5 in 10 children with Tourette Syndrome. Attention deficit hyperactivity disorder (ADHD, or ADD). This occurs in about 6 in 10 children with Tourette Syndrome. Learning difficulties. These occur in about 3 in 10 children with Tourette Syndrome. Mood disorders such as depression or anxiety occur in about 2 in 10 children with Tourette Syndrome. Conduct disorders. These occur in about 1-2 in 10 children with Tourette Syndrome. Self-harming behaviours such as head banging occur in about 3 in 10 children with Tourette Syndrome. Behavioural problems. Up to 8 in 10 children with Tourette Syndrome will also have some degree of behavioural problems. Generally, Tourette Syndrome is diagnosed by obtaining a description of the tics and evaluating family history. For a diagnosis of TS to be made, both motor and phonic tics must be present for at least 1 year. Neuroimaging studies, such as magnetic resonance imaging (MRI), computerized tomography (CT), and electroencephalogram (EEG) scans, or certain blood tests may be used to rule out other conditions that might be confused with Tourette Syndrome . However, TS is a clinical diagnosis. There are no blood tests or other laboratory tests that definitively diagnose the disorder. Studies show that correct diagnosis of Tourette Syndrome is frequently delayed after the start of symptoms because many physicians may not be familiar with the disorder. The behavioral symptoms and tics are easily misinterpreted, often causing children with Tourette Syndrome to be misunderstood at school, at home, and even in the doctor's office. Parents, relatives, and peers who are unfamiliar with the disorder may incorrectly attribute the tics and other symptoms to psychological problems, thereby increasing the social isolation of those with the disorder. And because tics can wax and wane in severity and can also be suppressed, they are often absent during doctor visits, which further complicates making a diagnosis. Because symptoms do not impair most patients and development usually proceeds normally, the majority of people with TS require no medication. However, medications are available to help when symptoms interfere with functioning. Unfortunately, there is no one medication that is helpful to all persons with Tourette Syndrome, nor does any medication completely eliminate symptoms; in addition, all medications have side effects. Instead, the available Tourette Syndrome medications are only able to help reduce specific symptoms. Recently scientists have discovered that long-term use of neuroleptic drugs may cause an involuntary movement disorder called tardive dyskinesia. However, this condition usually disappears when medication is discontinued. Short-term side effects of haloperidol and pimozide include muscular rigidity, drooling, tremor, lack of facial expression, slow movement, and restlessness. These side effects can be reduced by drugs commonly used to treat Parkinson's disease. Other side effects such as fatigue, depression, anxiety, weight gain, and difficulties in thinking clearly may be more troublesome. Medications are also available to treat some of the associated behavioral disorders. Stimulants such as methyphenidate, pemoline, and dextroamphetamine, usually prescribed for attention deficit-hyperactivity disorders, although somewhat effective, have also been reported to increase tics; therefore their use is controversial. For obsessive compulsive behaviors that significantly disrupt daily functioning, fluoxetine, clomipramine, sertraline, and paroxetine may be prescribed. Various psychological treatments can help to ease the symptoms and problems of Tourette Syndrome. These include cognitive behavioural therapy (CBT), habit reversal training and exposure and response prevention therapy. These treatments aim to help the child to recognise and control their tics. Often children are able to learn to suppress the tics during the day at school, but will need an outlet to release them at home. Psychotherapy does not help suppress the patient's tics. There is some evidence that providing parents and children with Tourette Syndrome with information about the condition, results in better outcomes. It is very important that your child's school teacher and others who are involved in your child's care should be informed and educated about the best way to manage this condition. Your child's teacher can have a very positive impact on your child's behaviour and development if they understand the problems that may be present. The use of surgery in Tourette Syndrome is only recommended for people with severe symptoms who do not respond to other treatment. Deep brain stimulation using electrodes implanted into the brain has produced encouraging results in limited trials. However, more research is needed to see whether it is safe to be used more generally. There is no known prevention of this Tourette Syndrome. However, some of the psychological complications can be secondary to the social limitations imposed by the disease. Close monitoring of the patient for the early detection of emergent emotional disorders is very important. Also, education of the persons that relate to him/her (family members, teachers, classmates, friends) may also help to create a better environment for the child and prevent emotional issues. Evidence from genetic studies suggests that Tourette Syndrome is inherited in a dominant mode and the gene(s) involved can cause a variable range of symptoms in different family members. A person with Tourette Syndrome has about a 50-50 chance of passing on the gene(s) to one of his or her offspring. However, that genetic predisposition may not necessarily result in full-blown TS; instead, it may express itself as a milder tic disorder or as obsessive compulsive behaviors or possibly attention deficit-hyperactivity disorder with few or no tics at all. It is also possible that the gene-carrying offspring will not develop any symtoms of Tourette Syndrome. A higher than normal incidence of milder tic disorders and obsessive compulsive behaviors has been found in families of individuals with Tourette Syndrome. Gender also plays an important role in Tourette Syndrome gene expression. If the gene-carrying offspring of a Tourette Syndrome patient is male, then the risk of developing symptoms is 3 to 4 times higher. However, most people who inherit the gene(s) will not develop symptoms severe enough to warrant medical attention. In some cases of Tourette Syndrome, inheritance cannot be determined. These cases are called sporadic and their cause is unknown. What is the prognosis of Tourette Syndrome? There is no cure for Tourette Syndrome; however, the condition in many individuals improves as they mature. Individuals with Tourette Syndrome can expect to live a normal life span. Although the disorder is generally lifelong and chronic, it is not a degenerative condition. Tourette Syndrome does not impair intelligence. Tics tend to decrease with age, enabling some patients to discontinue using medication. In a few cases, complete remission occurs after adolescence. Although tic symptoms tend to decrease with age, it is possible that neuropsychiatric disorders such as depression, panic attacks, mood swings, and antisocial behaviors may increase. Although students with Tourette Syndrome often function well in the regular classroom, it is estimated that many may have some kind of learning disability. When attention deficit-hyperactivity disorder, obsessive compulsive disorder, and frequent tics greatly interfere with academic performance or social adjustment, students should be placed in an educational setting that meets their individual needs. These students may require tutoring, smaller or special classes, and in some cases special schools. All students with TS need a tolerant and compassionate setting that both encourages them to work to their full potential and is flexible enough to accommodate their special needs. This setting may include a private study area, exams outside the regular classroom, or even oral exams when the child's symptoms interfere with his or her ability to write. Untimed testing reduces stress for students with Tourette Syndrome.